Spray foam roofs are tough, but they are not invincible. They can erode over time if you do not properly care for them. Because these roofs are flat, they can easily gather leaves and other debris over time. If you do not regularly clean off this debris, it can build up and slowly begin to compost or to attract pests, both of which can cause damage. Make sure you are doing a regular sweep of your roof to keep the debris off of it. The rain won’t be able to wash it away, so you need to be proactive in this regard. The liquid foam hardens to create a protective shell on your roof, but it is made stronger by a coating that protects the foam itself from UV rays and gradual damage. When that sealant starts to wear away, it exposes the foam, and the roof can start to erode. The process is slow, so you won’t notice it at first, but it will continue so long as the sealant is not providing the proper protection. You should re-seal your foam roof every five years or so, depending on the type of foam and the recommendations of your roofer. Find out the proper schedule, and stick to it. Your roof will last a longer time, and you’ll spend less money over the course of its lifetime. You can’t know what’s going on with your roof unless you get up there and look at it closely. Even then, you aren’t going to know what’s happening unless you are a qualified, experienced professional – or unless there’s an obvious, giant hole in the roof. The only way to really keep tabs on the health of your roof and to identify problems at their earliest stages when repairs are easier and less expensive to make is to get a regular inspection. You should hire a spray foam roof contractor to inspect your roof once a year. Many roofers will offer a protection plan for your spray foam roof. The plan might offer a maintenance schedule, or it might just offer a guarantee on the work. Talk to your roofing contractor about the types of plans available, and decide what will give you the most benefits for the longest period of time. Investing in this kind of plan can lengthen the life of your roof, which can save you money and reduce your stress over the years. The best way to extend the life of your spray roof is to partner with a reputable roofing company to protect its health. The right roofing company can ensure the longevity of your roof by overseeing its application and maintenance – making sure that every aspect of your roof care is done properly for the ultimate protection for your investment. Thoroughly research the roofing companies in your area to ensure that you are hiring a company that has a track record for great results and service. Then partner with that company to install your roof and to develop and implement a maintenance plan that is going to protect your roof. 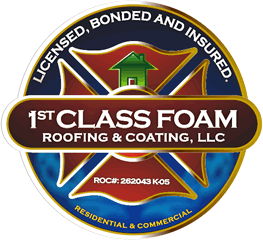 First Class Foam Roofing and Coating can install your new spray foam roof and then provide ongoing maintenance to keep your roof in its best shape. We specialize in urethane foam roofs and installation, and we also provide concrete coating, waterproofing, and polyurea linings. Call us today to schedule a consultation for a new spray foam roof installation or to schedule a roof recoat for ongoing maintenance.